Eligibility All artists living within a fifty-mile radius of Quincy, IL are eligible to enter. There are two separate divisions to enter. The Student Artist Division is for High School and College students. The Artist Division is for artists age 18 and over. Entry Artists may enter up to 3 works in either division, in any medium, and at no cost. 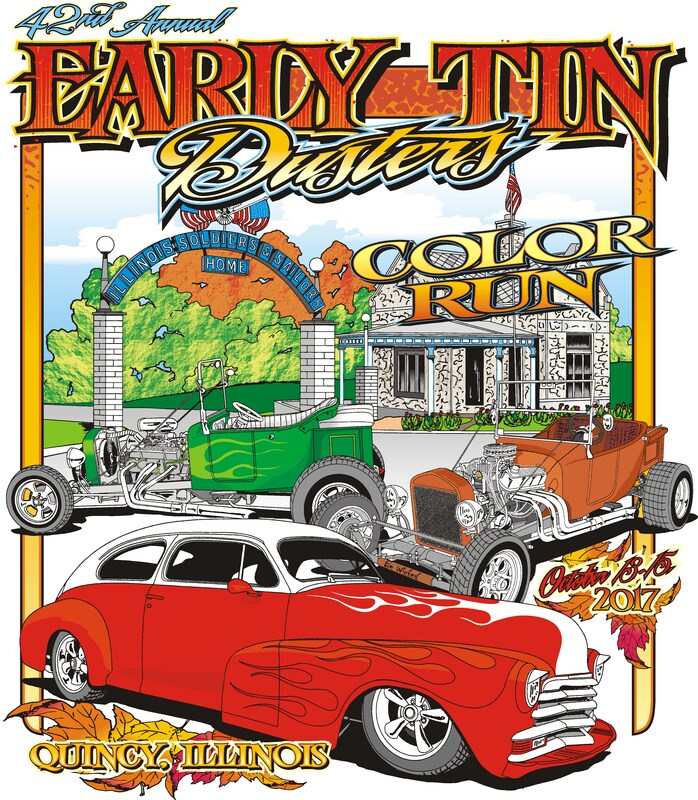 Artwork must reflect the theme ‘Fall Colors of Street Rodding’ and depict a pre-1949 Street Rod. Three-dimensional and two-dimensional artwork cannot be over 3 feet in any one direction. Artwork Drop off Saturday, October 13, and Monday & Tuesday, October 14 & 15 from 9 a.m. to 4 p.m. at the Quincy Art Center. Awards All awards will be presented at the discretion of the judge. Criteria for awards include originality in expressing the theme and quality of the artwork. Each division will be awarded cash and Quincy Mall gift certificates in the amounts of $250 Best of Show, $150 Second Place, and $100 Honorable Mention. Award winners will be publicized after the exhibit and used in the future marketing of the Early Tin Dusters, Quincy Art Center, and Quincy Mall. Participants will also have a chance to win art supplies and Art Center gift certificates. Judge John McCarty is the Early Tin Dusters Artist, owner of Outlaw Tees, and Mayor of Nauvoo, IL. All awards will be presented at the discretion of the judge. Criteria for awards include originality in expressing the theme and quality of the artwork. Auction Artists may choose to have their artworks included in a silent auction. The highest bid will be split with 40% of the sale going to the artist and 60% of the sale going to Camp Callahan.